July, 2010 | andrewANDORU. 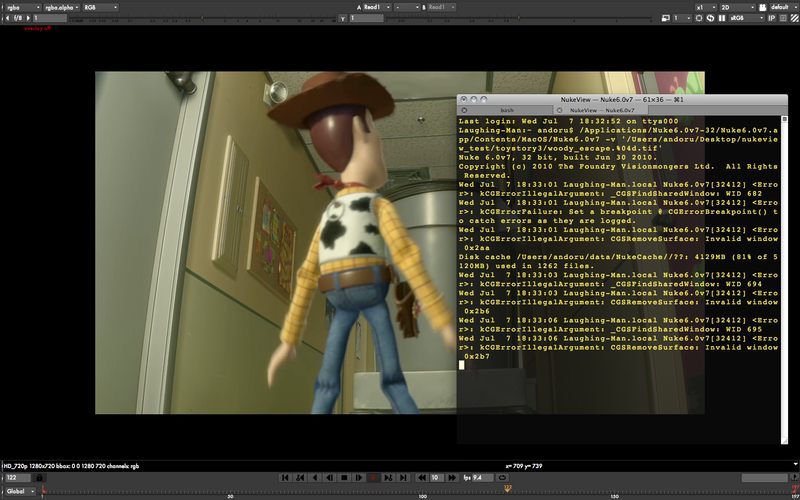 . .
After using Nuke for quite awhile now I have really started to like it’s built in viewer. It has easy controls to view multiple channels, simple region of interest, exposure and gamma controls, and proper keyboard shortcuts (jkl) for playback. I found myself often opening up Nuke just to use the viewer to take a look at renders and recently discovered while digging through the documentation that Nuke can be launched in viewer only mode using the command line. If you have ever visited this site before it is probably well apparent I am a fan of making AppleScript droplets for utilizing command line features of apps, and this was no different. NukeView is a simple app that allows you to easily open an image sequence in the Nuke viewer without going through all the steps of opening the app, creating read nodes, finding the sequence, etc. You can simply drag and drop any file in the sequence onto NukeView and it will open Nuke in viewer only mode, then begin playback of the sequence. As mentioned NukeView expects the “filename.count.ext” naming syntax and that you actually choose or drag and drop one of the image sequence files, not the folder that contains them. 3. Launch NukeView and it will ask you for the executable path, just drag and drop the Nuke executable (Grey UNIX file) from Finder into the open dialog. -2010.5.28: redeveloped to allow opening and drag and drop of any file in sequence, NukeView will find how many characters are in the fileCount and open it accordingly. -2010.10.6: updated for 64bit versions of Nuke (6.1v2…) that use new directory naming scheme. Please reset preferences before using this version. Enjoy! If there are any issues or concerns please contact: andoruLABS.support. Also, this app is free but feel free to donate like a maniac. 5 Comments on labs. NukeView. . .